Silver prices bounced up and down in the past year, some bounces more dramatic than others. For the year-over-year comparison, the silver market price from the March 2018 coin show to the March 2019 coin show decreased by $1.37 or 8.3%. Throughout the coin show's years starting in 1988, silver's price dramatically changed. Silver's peak value for 2018 occurred in January, then bounced up and down with an overall downward trend, but it is beginning 2019 with an up-tick. The New York market closed at $15.31 on the Friday before the March show, while the London market closed at $15.115. Take a look at this chart of the silver prices for March 2018 through March 2019 (London Market values). Each of these values reflect the prices on the Friday just prior to the monthly coin shows. Through the coin show years, silver prices fluctuated from a low of just over $3.50 per ounce to the high value of over $48 in April 2011. Silver's market values frequently bounce up and down in today's environment. The charts have been updated to include through the Friday before the most recent show. These charts do not reflect the silver bullion volatility occurring on other dates. 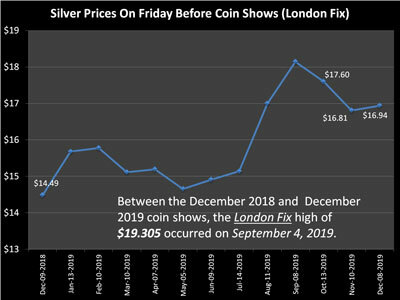 This chart shows the silver prices from the London Fix numbers just prior to each Sunday show through all the coin show years, 1988-to-date. 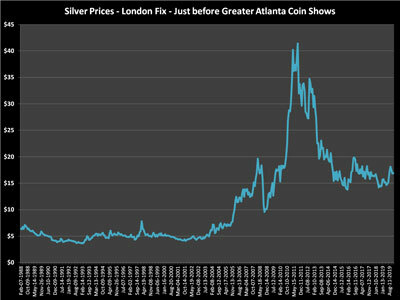 The numbers for the silver prices in the charts above were pulled from Kitco's historical silver data using London Fix values. 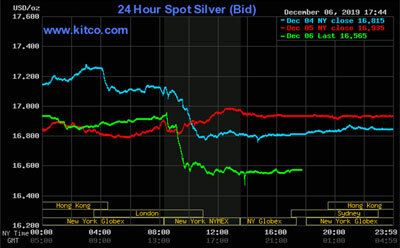 Click on historical silver information to go to Kitco's much more detailed data and charts. Their site provides much more detail of the daily values through these years rather than just the days before coin shows and the singular high and low points as shown in the above silver charts.